Laos — a small, landlocked, mountainous country wedged between China, Vietnam, Cambodia, Thailand and Burma — was once home to some of the best weavers in the world, masters of discontinuous supplementary weft, as detailed and ornate as European tapestry. However, during the "Vietnam" war, American B52s rained cluster bombs over Laos — more bombs per capita than in any other conflict until the 2003 bombing of Baghdad. Lao people were forced to flee their homes and their villages, often taking refuge in caves for years while the war raged on. Understandably, much was lost, materially and culturally. 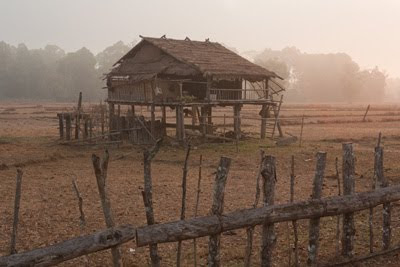 At the close of the war in 1975, life expectancy, literacy and per capita GNP in Laos were ranked some of the lowest in the world. 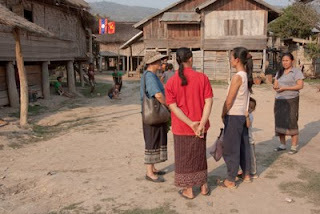 In the last 20 years, with much international assistance, Laos has slowly climbed to 133 on the United Nations’ Human Development Index of 182 countries. In an effort to support women and rural communities in these changes, we ride 11 long and crowded hours on a 2nd class bus through the mountains of Central Laos. When we arrive tired but safely in Xieng Khuang, we are warmly greeted by Kommaly Chanthavong, visionary and founder of Lao Sericulture Company. Two years ago we purchased some beautiful scarves made by them. This year we have made a special order, rather than purchase stock on hand at their shop in Vientiane, so we’ve come to see for ourselves where and how it will be made. "We work for our producers," Kommaly tells us early in our 3-day visit. As the visit unfolds, the importance of this simple statement becomes clear. This fair trade enterprise works with hundreds of families in this and neighbouring provinces. Sǔan Món – Mulberry Farm – becomes our home base. It’s a demonstration organic farm and a centre for research and training. It’s also home to a large but low-tech sericulture facility where silkworms are raised, new varieties are bred and silk yarns created. The farm also includes a weaving and dyeing centre, where most of Lao Sericulture’s natural dyeing takes place. Acres of mulberry bushes, heavily but carefully pruned, now fill fields where once only sugar cane grew. Mulberry leaves are the natural diet of silkworms, which only eat them fresh. We walk through the fields, nibbling not leaves but fresh mulberries, which are also used to make a range of purple dyes. Lao Sericulture is also developing mulberry wine as a new product. Not surprisingly, Lao Sericulture silk scarves are marketed under the brand name Mulberries. 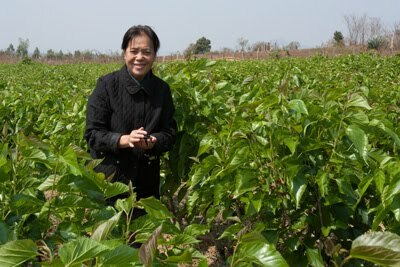 Lao Sericulture has a long-term lease on the land from the local government. In fact, the government invited Kommaly here to work with local village groups to reduce poverty by providing training and markets for sericulture, natural dyeing and weaving. 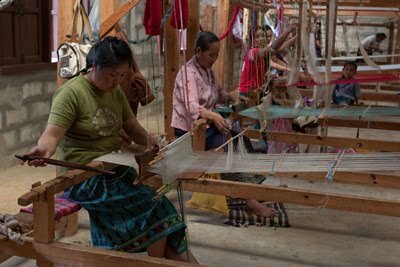 When villagers come to the farm for training, they are taught the entire cycle of silk creation as it is practiced organically and sustainably by Lao Sericulture. The scope of the operation impresses us both. We begin our visit with the cows, whose manure is a main component of the rich compost that feeds the mulberry plants. 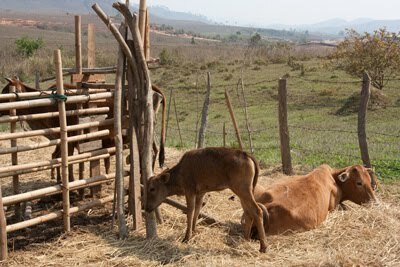 "This is where it all starts," Kommaly tells us as she explains that many of the villagers receive a cow, as well as training, and later return a calf to the farm so that the practice can be sustained. Kommaly goes on to tell us that 21 people will have their hands in the production of each of the silk scarves we’ve ordered. It’s easy to believe, as we visit a herd of cows, a large composting operation, and fields and fields of mulberry bushes: all of which are cared for by people rather than machines. We also go into the silk rearing houses where 4 different kinds of silkworms are carefully raised – without chemicals. During our visit they sit empty, however, as winters on the plateau of Xieng Khuang, although pleasantly cool for us Canadians, are too chilly for Bombyx mori – the cultivated silkworm – which prefer a consistent, warm temperature around 28˚. In one workshop, we watch the reeling and finishing of silk yarns. 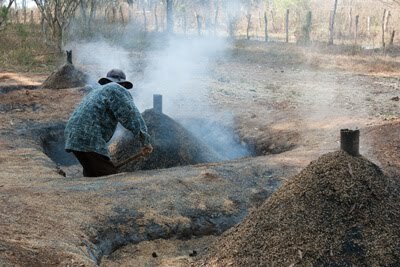 In another, we see dye pots filled with mulberry fruits, indigo, stick lac insect resin, leaves of all sorts, even mud. All of them simmer away on custom-made, fuel-efficient stoves that burn coarse sawdust from a nearby mill that processes hardwood timber. At the end of the first day, we visit the workshop where skilled weavers realize captivating designs based on traditional patterns as well as the images and colours that occur to Kommaly as she gazes at her favourite view. "My studio," she says, as she sweeps her hand towards the expanse of fields rising to distant mountains. This is impressive and important work, especially on the scale in which it’s undertaken, but what strikes us most is what we see the next day when we travel to 2 of the villages that are also part of the Lao Sericulture network. Villages like these are where the scarves we’ve ordered will begin life, as they’ll be woven with traditional Lao silk raised in small village households. Unlike the weaving groups in Thailand with whom we work, these households most often participate in only 1 step of the process – in this case, the production of silk yarns. We drive 2 hours – more than half of the time on an unusually narrow and badly fissured, unpaved road. 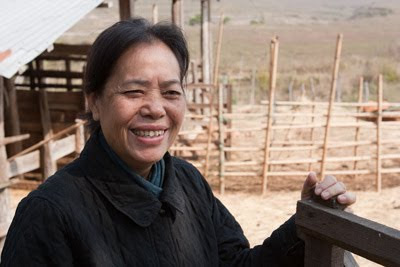 Before it was built a few years ago, Kommaly and her husband walked 5 to 6 hours along a dirt path to visit these villagers. While travel is much easier now, it’s still true that silk is an ideal cash crop for remote villagers, as it has a high value relative to its weight or volume. It can also be stored, waiting for transportation or customers, without spoiling. 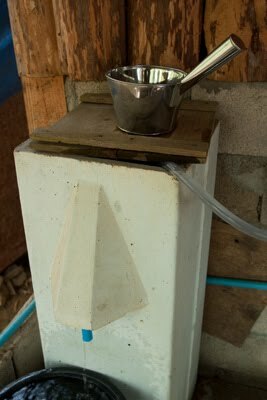 As well as providing income within this village, Lao Sericulture has helped the villagers build sand and rock water filters and better toilets. Together these projects have greatly improved health in the village. 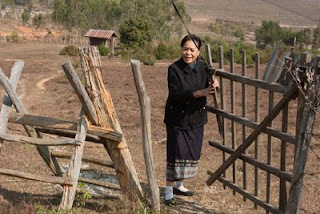 But despite the new road and activities like those of Lao Sericulture, we see deep poverty throughout the area. Most people in Laos are subsistence farmers but here we see bomb craters in what are now fields. We also see green onions and mint planted in bomb casings that recall the haunting exhibit we saw in Vientiane at the office of COPE (the Cooperative Orthotic and Prosthetic Enterprise.) Obviously, it’s a long road to recovery when you’ve been bombed back to the Stone Age, as some have said of Laos. A week later we pick up our order at Mulberries’ shop in Vientiane. 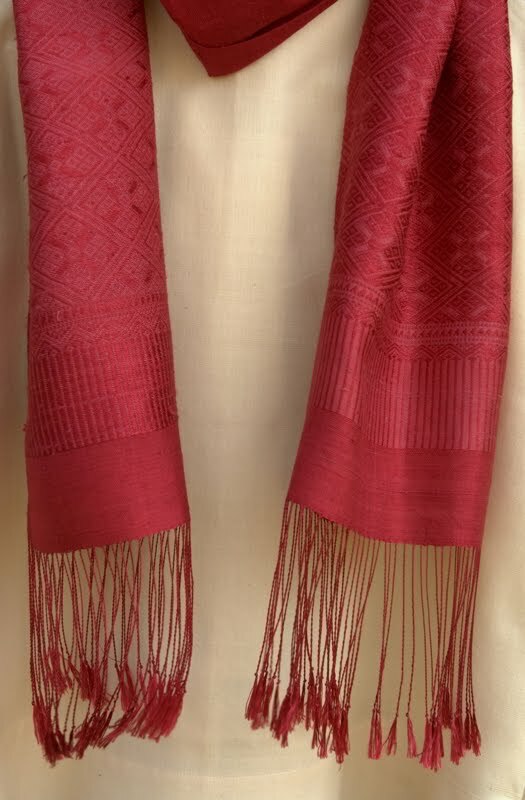 The traditional Lao silk gives the scarves a nubbly texture similar to the feel of linen but richer – a bit like the way lanolin makes wool so different from cotton. The colours we’ve chosen for the 2 designs in this year’s collection are gorgeous: pearled blue, eggplant, ruby red, sapphire, thatch, leaf green. We’re fascinated that each group with whom we work produces such a different palette, based on the plants that grow well in their region, and their own traditions and skills in creating natural dyes. Lao Sericulture is proud of its work and its recognition as a fair trade enterprise by the World Fair Trade Organization. Kommaly has received international awards for her designs and she was one of the 1000 peacewomen nominated for the Nobel Peace Prize in 2005. But we sense that most important to her is the reward of helping reduce poverty in northeast Laos while reviving traditional skills that were almost lost. We’re pleased to play a small part in that recovery, and proud to bring these artisanal and sustainable fashions to the West.